vinyl-graphics-lettering.com has been serving the Phoenix Arizona metropolitan area for over a decade. We have professionally designed vinyl graphics for 1000's of companies, corporations and small businesses. Visit our clientele page for a partial listing. We have produced professional layouts for vinyl lettering for banks in Phoenix, Peoria, Sun City, Tempe, Chandler, Mesa and window lettering in all of Glendale's Public Libraries. We have supplied ready-to-apply window lettering for construction companies in Glendale, Peoria, Scottsdale, Tempe, Chandler, Avondale, and Phoenix AZ. vinyl-graphics-lettering.com has designed and installed airplane graphics on airplanes in the Phoenix International Airport, Scottsdale Airport and Deer Valley Airport. Our in-house designed gold bamboo graphics can be seen at Bamboo Club asian bistro's from Phoenix Arizona to Scottsdale Arizona and all across the United States. We have supplied vehicle graphics for city governments in Chandler, AZ, Scottsdale, AZ, and in Phoenix, Arizona. vinyl-graphics-lettering.com supplies vehicle lettering for one of North America's leading waste and environmental services network and has designed graphics for most all of the local television stations in Phoenix, Arizona. Providing partnership opportunities through programs and services designed to assist in meeting your business goals. To provide member services that add value, both directly and indirectly. Our members will have access to unique opportunities, services and events -all designed to enhance their success. To engage in business development that includes attraction, retention, expansion, workforce development, and recognizes the critical role of redevelopment. We will continue to attract targeted new business investment while working to enhance the success of existing businesses. To shape public policy that governs the business environment. We are the voice of business and the guardians of the business climate. Our work will ensure that Scottsdale remains an ideal city in which to live and do business. To strategically facilitate the building of community vision. We will take the lead in shaping a powerful community vision - stimulating dialog, building a braintrust, achieving synergy. The Glendale Chamber of Commerce is a business association consisting of voluntary membership and a professional staff. In the greater Glendale area, the Chamber’ represents over 800 area businesses. From local retail, trade and professional services to manufacturing and exporting, Chamber member businesses provide goods and services, jobs and tax revenue to benefit the area’s economy. The Chamber serves the business community as the voice of commerce, provides programs and services to improve the economic environment for its members and supplies leadership for improving the quality of life. For area residents and newcomers, the Chamber is a reliable source for community information and a dependable resource for business referrals. General information and business referrals are available by phone (623.937-4754 or 1-800-IDSUNNY) Monday - Friday, and 24 hours a day by accessing our website at www.glendaleazchamber.org. 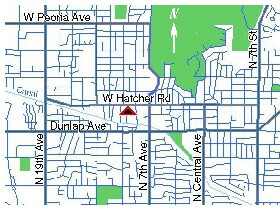 The Chamber office building is located in downtown Glendale at 7105 N. 59th Avenue and serves as an information center with a wide variety of brochures, maps, and information about the Glendale area, our business membership and the state of Arizona. Your Chamber has had a hand in creating an environment that will continue to be attractive for positive economic opportunities. Mesa is on the move and with the support of Mesa businesses your Chamber will continue to honor its charge of protecting and promoting responsible business policy, as we have since 1912. The Chamber is governed by officers and directors who set the policy for the Chamber, establish its goals and are responsible for its operation. Commerce Alliance, a coalition of East Valley chambers with a powerful lobbying force which represents over 5,000 businesses like yours. Serving its members, to act as the collective voice of business, industry and the professions, to maintain and strengthen a prosperous business climate in Mesa, and to enhance the quality of life in the community. The goal of the Chamber is to be an effective economical and political force for our membership. The Greater Phoenix Chamber's mission is to support the growth and development of business and the quality of life of our community, champion the voice of business in government and keep businesses informed, connected and prosperous. The Chamber's most valuable resource is its members, who get involved and help carry out our mission and work program. Our Board of Directors is made up of nearly 50 representatives from small and large businesses, including manufacturing, banking, services, media and other disciplines. The Greater Phoenix Chamber has forged strategic affiliations with several community and economic development-related organizations to create a united voice in government, offer increased benefits to members and open up new opportunities for member networks. As we enter in to another New Year for the Tempe Chamber of Commerce, it is both a pleasure and honor to serve as Chairman of the Board. The information contained in this publication will help provide an overview to the exciting City of Tempe and listings of current member in the Tempe Chamber. My first exposure to the Tempe Chamber was in the early eighties when I was at the Tempe Mission Palms. Four years ago, I came back to Tempe as the general manger for the Holiday Inn Phoenix-Tempe/ASU. At that time, I made a commitment to the Tempe Chamber. I hit the ground-running and have not looked back since. It’s been a great opportunity to meet so many people who work together for a common goal – to make Tempe the best place to live, work and play. Now, it is my goal to step into the shoes of previous chairpersons and continue the success of the Chamber as an advocate for businesses in the community. I look forward to an exciting year. We all have a vested interest in Tempe and the Chamber is here to ensure the economic vitality of our community. Partnerships with the City, Arizona State University and other organizations that shape this community is vital and we will continue to foster these special relationships. Tempe has many changes going on now. We promise to work close with the city Government to ensure a smooth transition and continue the success of our community. We will continue to work close with Dr. Michael Crow and his team; the new superintendents of Tempe Union High School District and Tempe Elementary School District and continue with Dr. Maria Menconi at the Kyrene School District. A strong education foundation leads to a vibrant community with rewarding jobs, a thriving business climate and an overall increase in quality of life. The Tempe Chamber will continue to work hard to bring many opportunities to your business from sponsorships, networking, advocacy and education. We stand behind our tagline, “Your Success is our Business.” We want you to get involved and meet contacts that will enhance your business goals. On the following pages of this directory, you will see the new committee chairs. This group of individuals will help the Chamber become a leader by developing business and educational groundwork, host various special events and provide you with programs and services that will enhance your bottom line. Our committees have a direct impact on the business community and so can you. Please take the time to join a committee that interests you because together we are strong. I encourage all of you to get involved. I look forward to seeing you during this exciting New Year. Thank you for your support of the Tempe Chamber. Our Chamber of Commerce is an action agency designed to meet community needs. It is a voluntary organization of individuals and businesses who work together to advance the commercial, financial industrial and civic interests of our community. The Chamber was Incorporated on June 30th, 1919 and is the oldest active Chamber in Arizona listed with the Arizona Corporation Commission. A chamber of Commerce is an action agency designed to meet community needs. It is an organization of individuals and businesses who band together to advance the quality of life and civic interests of the community. It is a civic clearinghouse, the community's public relations advisor, a legislative watchdog at the local, state and national levels of government, an information bureau and a research center. The Peoria Chamber of Commerce is a non-profit organization made up of members investing time, energy and money to make Peoria "a great place to live, work, shop and play™." Together, we encourage the growth of existing business and industries, assist new firms and individuals located in this area and promoting a positive image for Peoria. Since 1974, the Arizona Chamber of Commerce has been the voice of Arizona business and has represented the broad interests of Arizona’s diverse business community at the State Capitol, with state regulators and with members of Arizona’s congressional delegation. Our diverse membership employs 250,000 Arizonans in all business sectors from manufacturing to services and includes small, medium and large employers from urban, suburban and rural areas. The mission of the Arizona Chamber of Commerce is to promote a business climate that enhances economic vitality and improves the quality of life for all Arizonans.